The BenQ SH915 is the brightest choice for all of your meetings and large gatherings. Light and compact with Full HD image resolution, 4000 ANSI lumen brightness and 11000:1 contrast ratio, the BenQ SH915 offers a superior viewing experience even in well-lit rooms. It doesn't matter where you are, with a brightness of 4000 ANSI lumens, the SH915 will give you the best clarity under the brightest lights. The SH915 offers one of the highest standards of viewing--a Full HD resolution at 1080p. With a native 1080p resolution, combined with an astounding 11,000:1 contrast ratio, the SH915 delivers unmatched amazing picture quality. So, take advantage. 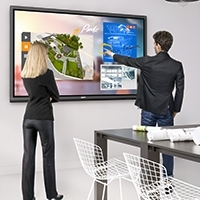 Stay in control and enjoy pristine presentations, while engaging your audience. The SH915 offers the highest standard of viewing – a Full HD resolution at 1080p. It supports multiple video formats including 480p, 576p, 720p, 1080i and 1080p, delivering 5 times more detail than traditional 480p projectors. With Full HD, every viewing experience becomes more absorbing. The combined expertise of BenQ's projector know-hows delivers an astounding 11,000:1 contrast at the highest to significantly improve the black level for superbly rendered image definition. 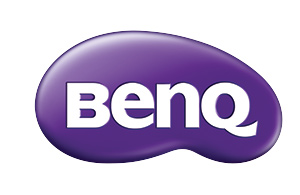 BenQ's SH915 is built with latest DLP technology to support 3D functionality, allowing schools, corporations and institutions to bring an immersive learning experience to their students and audiences with a simple preparation of 3D glasses and 3D content from your 3D Blu-ray player. LAN Control enables IT managers to perform day-to-day projector maintenance and repair tasks efficiently and effectively--offering them full access and control over every projector directly from their workstations. The SH915 offers seamless support for the Crestron and PJ-Link Control system. The upper lamp door is designed for IT managers to replace the projector lamp safely and quickly. Should the projector lamp go out in the middle of the class, it can be replaced quickly without delaying the class. SH915 1.5x big zoom feature opens up space with an impressively wide range of throw distances. All you have to do is simply place the new projector right where your original ceiling mount is. Without adding projector setting re-construction costs to your budget list, you'll get to save the money for better use. With the Quick Intall hotkey on the remote control, installers can quickly access installation related functions in the OSD menu. 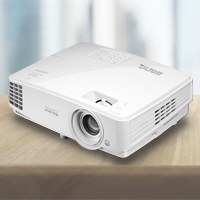 Offering lower TCO and optimized projection through dynamic power saving, uncompromised brightness, exquisite picture quality and optimized lamp life – SmartEcoTechnology has perfected what a DLP projector can do. With this innovation, schools and corporates are able to save up to 70% of lamp power consumption and lower maintenance costs through dynamic power saving features while bringing an ultra-vivid viewing experience into every presentation. BenQ's DLP SH915 projector is built with long-lasting enjoyment in mind, ensuring razor-sharp clarity, ultra-readability and true-to-life color for years to come. We use leading-edge DLP Technology to reflect pure light from millions of micro mirrors on a DMD chip through our advanced color wheels. Since the mirrors are colorless and protected within a sealed engine, BenQ's DLP SH915 projector has no aging problems and is virtually immune to image decay, consistently delivering picture excellence time and time again. 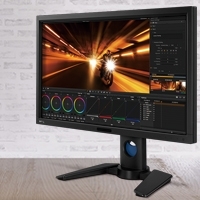 Even in well-lit venues, BenQ's SH915 achieves the optimal balance of brightness and color accuracy, with BrilliantColor Technology additionally boosting true-to-life colors that captivate. BrilliantColor enables up to six-color processing by incorporating the secondary colors Yellow, Cyan, and Magenta along with primary Red, Blue, and Green. From intense hues to elusive mid-tones like aqua blues and light yellows, your every presentation is rendered in pure, living splendor. Image Size (Diagonal) 26" - 300"
Three (3) years from the purchase date by the original retail purchaser (the "Customer") (except for lamps as specified below and refurbished units which have a separate warranty policy), parts and labor only (No advance replacement). Lamp Warranty: Lamp is guaranteed for 1 year or 2000 hours from the purchase date by the Customer, whichever comes first.